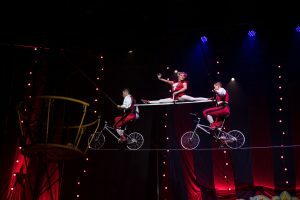 ST. PAUL, Minn. (June 27, 2017) — The glory days of the circus come alive again in “Circus 1903, The Golden Age of the Circus,” now playing at the Ordway Center for Performing Arts in St. Paul through July 2. Directed by Neil Dorward and co-produced by Simon Painter, “Circus 1903” is a must see performance for anyone and everyone. Unequivocally, you will have the time of your life! I honestly cannot think of anyone who would not fall in love with the Broadway Show. It’s unimaginable to realize the time each performer has dedicated towards perfecting true abilities displayed on stage. Circus 1903 The Golden Age of the Circus is the show where, “You must see it to believe it!” Spectacular performers from around the world come together to demonstrate hope, possibility and awe-inspiring talents. Yevgeniy Dashkivskyy and Yefre Bitkine from the Ukraine performed acrobatics with incredible precision similar to Ms. Gabrielle Douglas who brought home the American gold in 2016. Alejandro and Ricardo Rossi started a professional career in Germany learning to juggle . . . each other and on their feet. Watching them toss one another up in the air made my back twinge as I recalled the, Seven Minute workout I did one day this summer. The brothers however, have performed over 100 times and have incredible strength! On the tight rope, the Lopez family performed death-defying acts. While I was concerned that they should be wearing helmets given the latest studies on Traumatic Brain Injuries (TBI), it was obvious that they have mastered amazing stunts: balancing, teetering and riding bikes on a tight rope effortlessly and with self-assured confidence. As a mere mortal, it’s difficult to imagine that humans are capable of vast and amazing talents. Yet, each performance was full of color, mystique and authentic talent that transcended my limited ideas about ways in which dedication and hard work can manifest into implausible physical talent. Anny Laplante started young, hoping to become a professional wrestler. Andrei and Anny worked together to combine artistry into a beautiful athletic duet. Elena Gatilova is a former World Champion gymnast, who has performed countless venues. Audience members watched her in awe as she twirled upside down and in the air. Zach Benson, an 11th grade student from Blain High School asked, “How does she do that?” Florian Blummel, from Germany has been fascinated with the art of cycling from the age of 6 years old. Like other performers who have been on television, in movies and highly regarded productions, his bike appears to be a natural extension of his body as he performed on stage. Meanwhile, Fracois Borie, put on a juggling performance, which magically astonished everyone. I was memorized from beginning to end. Artur Ivankovich, Petter Vastermark and Ilya Kotenyov, natives of Belgium, literally flew through their act. Mikhail Sozonov continued his family legacy in the circus through a grand balancing act. Nyron Levy, who was the head puppeteer, created a life like production, similar to, The Lion King. Finally, David Williamson did an outstanding job as Ringmaster. Williamson’s humor, delight and enthusiasm brought all of the acts together igniting non-stop laughter. Each performer is an artistic visionary whose talents breathe life into a production that stunned everyone. I enjoyed the show so much I’m taking my great nephew and seeing it again on Friday night. It’s human potential at the highest level.